Just got word from the good folks over at Harley-Davidson that a loaner Forty-Eight, the latest Sportster-based bike in the Dark Customs lineup, will be coming my way next month. If you read this here, it’s pretty obvious that I’m a fan of this growing class of bikes. Low, light and quick. Good stuff all the way around. With 2009 quickly coming to a close, we’d be remiss if we didn’t tackle that trite-but-true end-of-the-year cliche known as the Top Whatever Stories List of (Fill in the year). Some of the time these stories are picked by readers, other times they’re chosen by editors/reporters. At Dealernewsblog we’ll opt for the former, based on the site visitor stats calculated by the good folks at WordPress. We wish we had the energy and certitude to assemble a bevy of what we feel are the top powersports industry stories of 2009, but we’re kind of fat and lazy after snacking on too many holiday cheese logs, so we’ll leave this up to the cold analytics of the WordPress dashboard. For a more measured and thoughtful approach to the top stories, our own Joe Delmont is assembling a Top 10 list that should be appearing soon (link to come!). Ducati Working on Adventure Tourer? For me, one of the absolute wonders of riding a motorcycle has always been that minute you crest a hill and start to let gravity influence your ride. Where it’s less of you piloting the bike and more of you just riding it. While I love uphill cornering and sections of twisties — with all the physics they represent as I roll off, brake, lean and accelerate in that sublime danceable rhythm — it’s that moment, when you’re no longer pushing it that grabs me and lets me fly. As a kid I used to trek up to the higher points of the South Bay area of Los Angeles on my Strand cruiser and then make that bomb run downhill. Free flying. Wind swooping. Sensory overload. The pull of flat land bringing you down to its level. It’s the pure sensation of motion, where movement and rolling forward is the only thing. Note the grainy, thumb-in-photo, camera-phone quality that makes this look like a sneaky spy pic. Picked up the Harley-Davidson Iron 883 today over at the H-D fleet center. Man, I love that place and today I had the pleasure of talking with Todd Canavan, one of the Super Tech Gurus who helps run the fleet. Canavan’s explanation and overview of the Iron 883 was amazingly thorough and for this I say Thanks Todd. Good stuff. He even brushed through the magic that is the Harley self-canceling turn signal system that was apparently designed by NASA or space aliens. 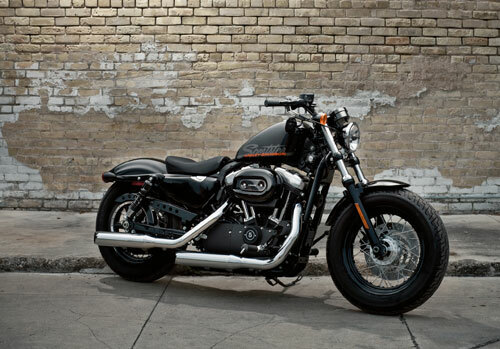 Just got word that I’ll be picking up a new Iron 883 Sportster from H-D on April 20th. I’ll have it for two weeks — that’s two weeks of tearing around town just like I did with its closest relative the Nightster. As I said here, I really liked the first Dark Custom Sporty. It was a great little hot rodder that blasted through turns all tight and scrapey. That Nightster also got a fair amount of attention from the motorcycling and the non-motorcycling world. The bike would get thumbs ups at stop lights and at the gas station. Even my chopper-riding, rock-a-billy, tattooed barber dug that action. All of which leads me to believe the Iron 883 will get more of the same as my original story on the bike’s introductory PR has consistently been the No. 1 viewed story on this blog. Search terms involving Iron 883 or some variation thereof are also the most common terms used by people who found the DealernewsBlog. So, stay tuned and be sure to check out our review of the Iron 883 some time in early May. that rarely ran and often just sat there. This is one of the only surviving pics of my old AMF Sportster that I mentioned in the early post about the Iron 883. I had the top end rebuilt, did the carb and rewired it but I could never iron out all the wrinkles. Ended up trading it for a 1979 Camaro (that ran on seven cylinders) and $500. Loved that tank badge, but apparently hated MTV at one time. In its oh-so clever way, Harley-Davidson today sprung its newest variation on the Sportster theme — the Iron 883. Not one to follow the typical OEM format for releasing new models, H-D likes to quickly (and sometimes quietly) introduce its latest bikes. Take the soft launch of the XR1200 back in December (here, here and here). So today in my inbox I find the announcement about the Iron 883. This is the latest edition to H-D’s Dark Custom lineup. It is basically a Nightster with Harley’s 883 Sporty motor in it and a price tag (MSRP $7,899) that reflects the smaller power plant (the Nightster carries a $9,899 sticker). It’s got most of the same all-black bits and the fork gaiters. An it uses the same trick turn-signal/brake light/tail light combo used on the Nightster as well as the same side-mounted license plate that folds back. (I’ve often wondered about the purpose of the folding plate and how it might work in going up against a red light camera. Not that I’d ever endorse doing something like that. I’m just saying.) Enough bloviating. Here’s some pics. Personally, I’m a big fan of H-D’s Dark Customs. Not so much of the marketing campaign behind them, but the bikes themselves are pretty neat. Back when the Nightster was first launched I got a loaner for a few weeks and spent a lot of time blowing around town on that thing. It was a far cry from my AMF-era Ironhead Sporty, which sat more often than it ran, but looked really good sitting. I really became fond of tearing around on that little hot rod Nightster. It handled and moved and scraped hard parts through just about any turn right or left. And, not that I cared much given it was a press bike, it got thumbs up and attaboys at every stop. Most people really dug the look of it, as did I. Maybe I’m forgetting, but I don’t recall having any real issues with it other than the anemic stock pipes it comes with, but that’s just an aftermarket call away from being fixed. Overall, it is a great bike for zipping around on. With that said, I’m going to see about getting an Iron 883 for review and I’ll let you know what effect (if any) the drop in power has on such a little runabout. And now for some more specs/info.